PRODUCT: SIEVERT HAK2-30, HOT-AIR FLAMELESS LAP WELDING KIT. 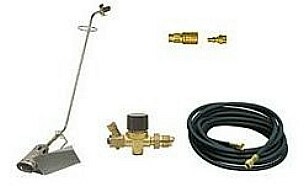 INCLUDES STAND-UP HOT AIR WELDER, 25' HOSE, REGULATOR, QUICK CONNECT FITTINGS. PRICE/KIT. APPLICATIONS: This propane gas based hot-air flameless torch kit is the safest method for heat welding wide and end lap seams in modified bitumen (both APP & SBS) and coal tar membranes. Produces high quality uniform bleed-out and is faster and less expensive than electric versions.